ACH550 drive with E-Clipse Bypass is wall mountable in a vertically integrated UL Type 1 enclosure. 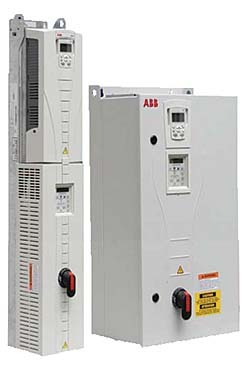 Drive is available in 1-25 hp (208/230V), 1-60 hp (480V), and 2-50 hp (600V). Bypass is a microprocessor-controlled system which supports programmable Class 20 or 30 overload curves, programmable underload, and overload trip or indication. Standard features include single-phase protection in bypass mode, programmable manual or automatic transfer to bypass, fireman's override, smoke control, damper control, and serial communications.